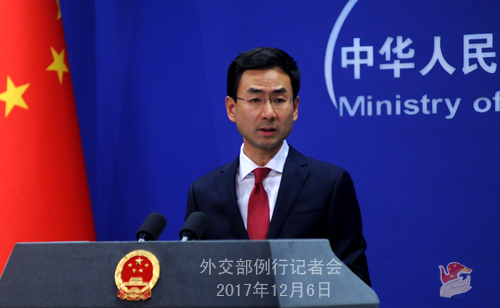 The 15th Meeting of Foreign Ministers of China, Russia, and India will be held in New Delhi, India on December 11. Foreign Minister Wang Yi will lead a delegation to the meeting. During the meeting, the three foreign ministers will have a thorough exchange of views on major international and regional issues of common interest and trilateral practical cooperation, in light of the current international landscape. We believe that with the concerted efforts of the three parties, this meeting will achieve what is expected from it. Q: A US senior official said that President Trump may declare formal recognition of Jerusalem as the capital of Israel on December 6 and would delay relocating the US Embassy in Israel for another 6 months. What is your comment? A: We have noted the report and are paying close attention to the relevant development. What we worry about is any potential flare-up of regional tensions. The status of Jerusalem is a complicated and sensitive issue. All parties shall bear in mind regional peace and tranquility, proceed with caution, and avoid impacting on the long-standing basis for the settlement of the Palestinian issue or triggering new rivalry in the region. Q: Do you have more details on the schedule of ROK President Moon Jae-in's visit to China? What will be discussed and what is China's expectation for his visit? A: We just released the information of his upcoming visit this afternoon. At the invitation of President Xi Jinping, ROK President Moon Jae-in will pay a state visit to China on December 13-16. China and the ROK are close neighbors. This visit will be President Moon Jae-in's first visit to China after assuming office. Chinese leaders will meet and hold talks with President Moon Jae-in to exchange views on bilateral relations and international and regional issues of common interest. As far as I know, he will also visit Beijing and Chongqing during his China visit. We hope that this visit will play a positive role in helping China-ROK relations improve and develop and in strengthening bilateral communication and coordination on the Korean Peninsula issue and other issues. Q: The 3rd round of Sino-Japanese Entrepreneurs and Former High-level Officials Dialogue wrapped up in Japan on December 5. The statement issued by the meeting said that efforts to promote infrastructure development are essential and called for close cooperation on the Belt and Road Initiative. What is your comment? A: We have taken note of the statement as well as these positive attitudes inside Japan towards participating in the Belt and Road Initiative. We keep saying that the Belt and Road Initiative is an important platform for international cooperation and a major public good for the whole world. Such an open and inclusive initiative, though originated in China, belongs to the world. We look forward to the active participation of all like-minded countries. 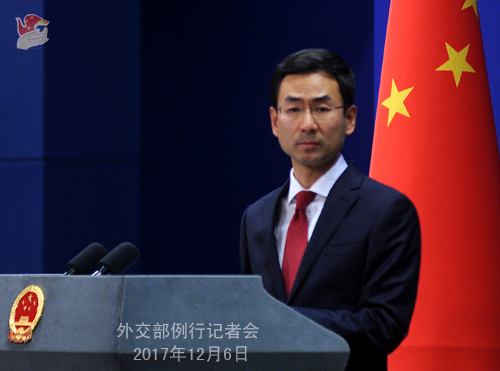 Following the principle of extensive consultation, joint contribution and shared benefits, China stands ready to work with all parties including Japan to explore ways to jointly implement the Belt and Road Initiative, so as to create more space and opportunity for the development of all countries and for the global economic growth. Q: On December 5, the International Olympic Committee decided in Switzerland to ban Russia's participation as a state in the 2018 Pyeongchang Winter Olympic Games. What is your comment? A: The Chinese government sticks to its anti-doping position. At the same time, we believe that the legitimate rights and interests of all clean athletes must be guaranteed, and the principle of fairness and integrity in sports be safeguarded. Q: The EU today adopted a tax haven blacklist. Macau was among those named. A "grey" list was also adopted which includes Hong Kong. What is your comment? A: As far as I know, the government of the Macau SAR has already given a response. The relevant decision made by the EU does not comply with the real situation in Macau. Regarding Hong Kong, I need to check on the details. Q: According to the Japanese media, the Japanese government has decided to acquire missiles that would give it the capability to strike enemy's military bases, and such expenditure has been included in its 2018 annual budget plan. What is your comment? A: Due to historical reasons, Japan's moves in the military and security fields remain a cause for concern for its Asian neighbors and the international community. We urge the Japanese side to exercise caution and play a positive and constructive role in maintaining regional peace and stability. Q: Jilin Daily had a full-page article today about prevention and protection against nuclear arms without mentioning the tense situation on the Korean Peninsula. What about the other governments of provinces sitting near the China-DPRK border? Are they also making preparations for the DPRK nuclear threats or trying to educate the public on the threat? I do encourage you to follow the reports made by the local media of other Chinese provinces, municipalities and autonomous regions, which will certainly help flesh out your perception of China. As for Jilin Daily's article, my understanding is that the Jilin authority has already made a response to that. Q: The US Air Force flew B-1B bomber near the Korean Peninsula. What is your comment? A: I have no information on this latest development yet. We keep stressing that the current situation on the Korean Peninsula is tense and sensitive. We hope that all relevant parties could exercise restraint and refrain from heightening tensions on the Korean Peninsula and provoking each other. Q: The Ministry of Maritime Affairs and Fishery in Indonesia has reportedly seized a Chinese fishing ship and arrested its 21 crew members for allegedly fishing illegally in Indonesia waters. Do you have any information on this case? A: The relevant Chinese authority is handling the incident you mentioned. According to the information I have, this fishing boat operated in the related waters with the approval of the East Timor government. We have communicated and lodged representations with Indonesia and East Timor through diplomatic channel to advance the proper settlement of this incident and the early release of the Chinese fishing vessel and fishermen. Q: First, Russia's Deputy Foreign Minister has said that Russia is ready to exert its influence over the DPRK through its communication channels with Pyongyang. I am wondering if China sees this as a major new development? My second question is that the UN Human Rights Council on Tuesday condemned in a resolution "the very likely commission of crimes against humanity against Rohingya Myanmar". And China was one of the three countries to vote against it and that caused human rights groups to criticize China on the issue. I am wondering how China responds to that criticism? A: With regard to your first question, as we have been saying, China welcomes any effort and proposal that will help to ease the tension on the Korean Peninsula, promote the denuclearization of the Peninsula and uphold peace and stability of the Peninsula. China and Russia share similar position on the Korean Peninsula nuclear issue and have maintained close communication and coordination all along. 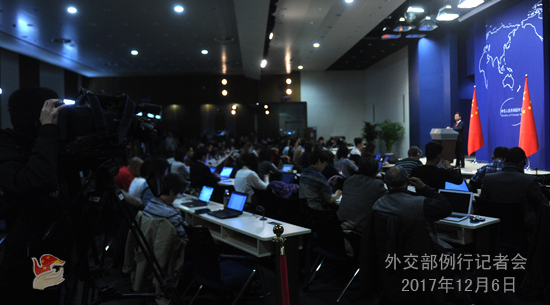 On your second question, China always stands for resolving the differences on the issue of human rights through constructive dialogue and cooperation on the basis of equality and mutual respect. The relevant Myanmar-related resolution of the Human Rights Council's special session does not lend help to easing the tension or resolving the issue. It may only complicate the issue, exert negative influence on the implementation of the repatriation agreement by Myanmar and Bangladesh, and impede the process of addressing the Rakhine issue. This is not in the interests of Bangladesh, Myanmar and the rest of the international community. China always believes that the dialogue and negotiation between Myanmar and Bangladesh are the only way out. Foreign Minister Wang Yi visited Myanmar and Bangladesh not long ago with the proposal of the three-phase solution to the Rakhine issue, which is positively received by both sides and gains widespread approval of the international community. Recently Myanmar and Bangladesh have interacted with each other for several rounds and signed a memorandum of understanding on the repatriation of the displaced people, and the situation on the ground has been remarkably deescalated. This is conducive to both countries and the peace and stability of the region as well. We hope the international community will continue to help with the bilateral dialogue and negotiation between Myanmar and Bangladesh in a constructive manner and create enabling external conditions. Q: First, you just announced Mr. Wang Yi's visit to New Delhi to attend the Foreign Minister's meeting of Russia, India and China. Will he also use that opportunity to have bilateral discussions with the top leadership of India? And my second question is about the visit of Maldivian President. Can you just provide us some details? There was controversy regarding the FTA signed between China and Maldives recently. There were the opposition parties in Maldives that have criticized the agreement saying that it is going to end up landing Maldives more in debt. I appreciate your reaction to this. A: Regarding your first question, as I said just now, Foreign Minister Wang Yi will attend the 15th China-Russia-India Foreign Ministers' Meeting in New Delhi. As far as I learn, on the sidelines of the meeting, Foreign Minister Wang Yi will engage with senior officials of India. We will release relevant information in due course. As to your second question, President of Maldives will pay a state visit to China from December 6 to 9 upon President Xi Jinping's invitation. We hope this visit will further enhance mutual political trust between the two countries, deepen our practical cooperation and advance the sustained, sound and steady development of bilateral relations to the benefits of the two peoples. With regard to the free trade agreement between China and Maldives, I would like to tell you that the negotiation and signing of the China-Maldives free trade agreement are part of the important consensus reached by the leaders of the two countries and in line with the trend of economic globalization. The two sides have conducted several rounds of negotiation with the principle of mutual respect and equality and mutual benefit, and come to this fairly high-standard, mutually beneficial and win-win free trade agreement at the end. This is not only conducive to the sustainable development of China-Maldives bilateral economic and trade relations, but also to the improvement of the trade and investment liberalization and facilitation of this region.